Luke Daunivalu off to Australia while Yogesh Punja heads to India. President Major General (Ret’d) Jioji Konusi Konrote and his wife bid farewell to two Fijian diplomats taking up new foreign postings. 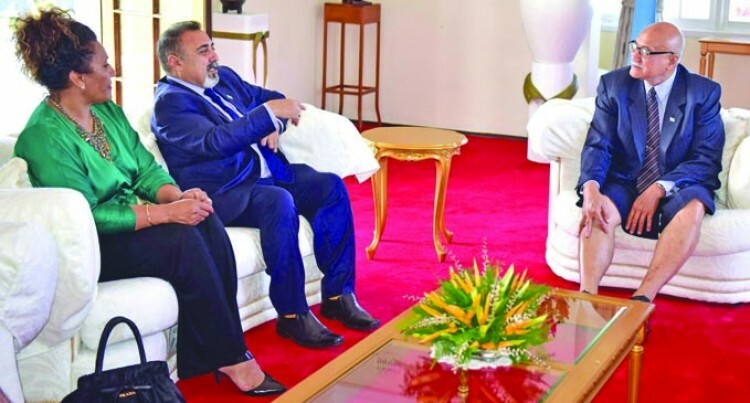 Fiji’s High Commissioner-designate to Australia, Luke Daunivalu, and Fiji’s High Commissioner-designate to India, Yogesh Punja, were seen off at Borron House in Suva on Tuesday. High Commissioner Daunivalu, who was commissioned at Borron House last week, was previously Fiji’s Deputy Permanent Representative to the United Nations in New York. High Commissioner Punja, who takes up his post in New Delhi soon, was previously posted to Fiji’s Permanent Mission in Canberra.